What is the INTRATE Function? 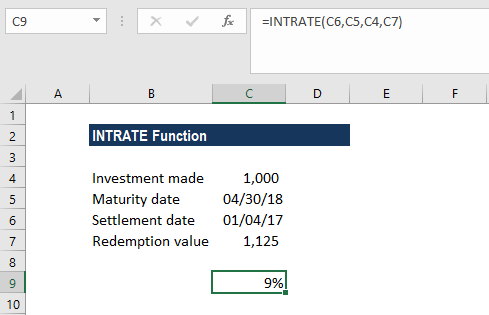 The INTRATE Function is categorized under Financial functionsFunctionsList of the most important Excel functions for financial analysts. This cheat sheet covers 100s of functions that are critical to know as an Excel analyst. It will calculate the interest rate for a fully invested security. The function was introduced in MS Excel 2007. As a financial analystFinancial Analyst Job DescriptionSee a real Financial Analyst Job Description including all the skills, experience, and education required to be the successful candidate for the job. Perform financial forecasting, reporting, and operational metrics tracking, analyze financial data, create financial models, we regularly come across scenarios where we need to evaluate investments. The INTRATE function is particularly useful in calculating the interest rate of an unlisted bond. Settlement (required argument) – It is the settlement date of the security. The settlement date of a security is the one after the issue date when the security is traded to the buyer. Maturity (required argument) – It is the maturity date of security or the date when the security expires. Investment (required argument) – It the amount that is invested in the security. Redemption (required argument) – It is the amount we will receive at maturity. 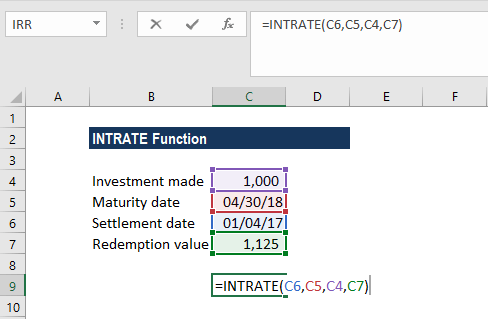 How to use the INTRATE Function in Excel? As per the data above, the INTRATE function is used to calculate the interest rate of an investment of $1,000, which was used to purchase a security on January 4, 2017. The security will mature on April 30, 2018, with a redemption value of $1,125 and the US (NASD) 30/360 day count basis is used. The date arguments are provided to the function as references to cells containing dates. The [basis] argument is omitted so it took the default of 0 (US (NASD) 30/360 basis). The settlement dates given in the argument is not in a valid format. The maturity date is not given in a valid format. The given value of the investment is less than or equal to 0. The given redemption value is less than or equal to 0. The given maturity date is less than or equal to the supplied settlement date. Remember that Excel stores dates as sequential serial numbers so they can be used in calculations. By default, January 1, 1900 is serial number 1, and January 1, 2018 is serial number 43,101, because it is 43,101 days after January 1, 1900. Settlement, maturity, and basis are truncated to integers if they are in decimal format.